Asghar Farhadi has won two Best Foreign Film Oscars with A Separation and The Salesman, while directing other acclaimed films such as About Elly and Fireworks Wednesday. Basically, he's set an impossible standard for himself, and if we are to believe the lukewarm response to his latest, Everybody Knows, Farhadi has failed to measure up. Again, it's an impossible standard. Everybody Knows pairs up real-life spouses Penelope Cruz and Javier Bardem for a Spanish-language thriller about a woman who returns to her hometown in Buenos Aires for her sister's wedding. 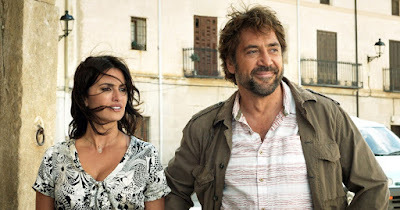 There she reconnects with family, friends, and a former flame (Bardem), until the celebration is disrupted by the kidnapping of her daughter, which threatens to expose long-hidden secrets. The response out of Cannes was definitely mixed, with the consensus being that Farhadi has made his first truly average movie. It played recently at Middleburg and, honestly, it didn't even cross my mind to see. It will still receive an Oscar-qualifying run in L.A. beginning on November 30th, followed by a limited release on February 8th 2019.